Entropy analysis is typically applied for disks coming from a RAID. Analysis of RAID entropy allows to get more information about RAID configuration that may significantly narrow the number of variants both for automatic and manual RAID recovery. To use entropy analysis correctly, please select RAID member disks individually rather than a RAID as a whole. ReclaiMe Pro calculates entropy on disks, which are supposed to belong to the same array thus helping to get more information about the RAID in question like what array type you deal with. Entropy analysis is launched from the Disk and partition list window where all the available storage devices and created regions are listed. Usually this analysis is applied for several devices simultaneously, most often to get more information about RAID, but you can use it for a single device as well. During entropy analysis, ReclaiMe Pro scans and processes data on all the selected devices from the beginning to the end of the smallest device. Note that entropy is recalculated every time you change the number of disks or block size. Allows you to set the block size value from 512 B to 4096 KB. If you deal with a set of disks from RAID, you need to specify the size of one RAID block; in case of a RAID with delayed parity – the size of all sequence of parity (the block size multiplied by the delay factor). You should specify as many disks as the original array contained including all the missing disks and excluding hot spare. If you are unsure of the correct number of disks, you can try several variants and see what it brings. Note that for entropy analysis, the correct number of disks is more important than the correct block size. The automatic scale mode is set by default giving you the better entropy visualization. In the manual mode, you can specify maximum and minimum values for the vertical axis. The full scale range of entropy is from 0 to 8 bits per byte. 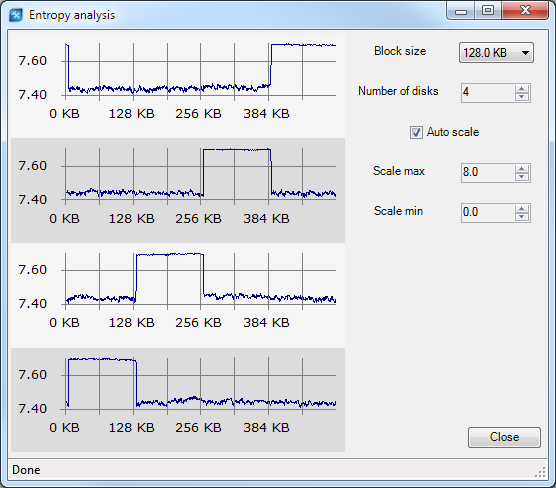 Entropy analysis is a useful tool for various RAID recovery tasks. Its essence and a variety of examples of its use are explained in Logical Data Recovery book and in our data recovery video.